a very nice solar powered model. 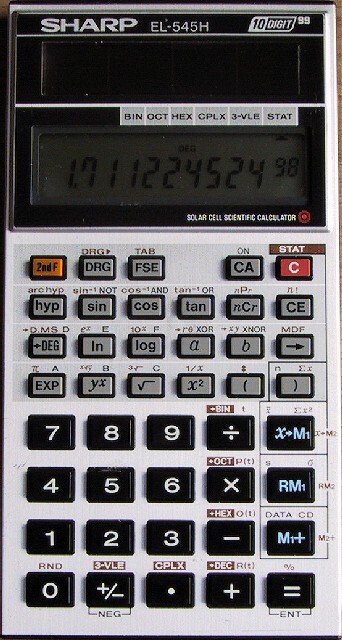 in many ways an improvement over the el-512, although not programmable and a solar version of the famous el-506. the same quality feel as earlier sharp models, entirely solar powered without batteries, an excellent set of scientific functions and a 10+2 lcd display. calculations are accurate to 12 figures internally. featuring two memories, stats, number bases, complex numbers and solutions to 3 variable linear equations. although stats are 1d, a surprise was to find normal distribution on offer. p(t) is the normal probability from -inf to x, whilst q(t) and r(t) are variations (0 to x, and x to inf resp). complex number support was a bit of a let down, `a' and `b' keys allow the input and recall of complex numbers, but it appears the machine can only perform the basic 4 operations with them. even x^2, 1/x and sqrt(x) did not operate. upon which the machine solves for x, y and z, if possible. having solar power is always neat and it works well even under artificial lighting. sometimes on startup you have to clear the machine with the ca button because it powers up in an unpredictable state, but this is true of other solars like the fx-85. other nice touches are x^2, combinations and permutations, hyperbolics, and a backspace key for correcting mistakes.